Find all the details on growing a money plant in water or soil indoors or outdoors. Q. How many times should you water a money tree? A. Water when the top 2-3 inches of the soil dries out between watering. Q. Why are the leaves of money plant discoloring, turning yellow and dropping? A. It may be due to a couple of reasons:If your tree is in too much direct bright sunlight. This may bleach the leaves. Move your money tree to a place that receives lots of indirect light. Yellowing of leaves can indicate too much or to little water. An abnormal iron or phosphorus in the soil can be the reason of yellowing of the leaves. This deficiency may occur if you are watering too much the nutrients get leeched away. You may feed your money plant with a slow release complete fertilizer. It my also be due to plant stress. Q. Where to keep the money plant? Do they need a lot of light? A. The best place to keep your money plant is the bright area of the house, it may be in direct sunlight. Remove the plant from very bright hot sun light. Q. What is the best water; rain, distilled or tap water to use on a money tree plant? A. Money plant can grow well normal tap water. Q. My money plant leaves have many tiny holes, What are the common insect problems on the money plant? Aphids and mealy bugs are the most common insects on the money plant.To get rid of these, you may use a weak spray of neem oil, or wash with an insecticidal soap with warm water. Q. Why is my money plant losing leaves? A. Some leaf loss is not unusual for money plants as in all other trees. However, if you money plant is near AC vent, then cold or dry hot air can damage your tree. if the soil is not proper adn you are watering too much then also the leaves can drop. Q. What is the best soil for money plant? A. Use a free-draining nutrition rich soil to avoid root rot. if the soil is not free-draining,add some river sand in the soil. Q. How do you take care of money plant? A. The money plant needs little care if you take care of proper soil, light, watering and fertilizer. For details, you see money plant . If you have any question about money plant, then first read all the questions and answers below. If you do not get answer to your question, then ask your question in the form below. I put a cutting of money plant in water about a month ago, it has now formed new roots. Can I transplant this to a pot. You can transfer the rooted money plant in water to soil in a pot. I have put a cutting of money plant is a water bottle. Will it creep in water and form a vine? Yes, money plants creep in water also and make a vine, however it will be slow. I am growing my money plant in a small bottle. How often should I change its water? You can keep the same water for 3-4 weeks. But if you see that the water inside the bottle in which the money plant is growing becomes turbid, change it. Very helpful information! Thanks for sharing! Helped me in my school project! i got this plant as a gift in a small jar filled with soil. that time only two leaves were there. but there was no improvement in growing. after that i changed that into a big jar and filled with soil. i am keeping that in direct sun light. now new leaves are growing but the old leaves turning into brown ie, like burning type. there are changing. i am watering it daily. what to do now? 1. The plant will take sometime to come over the shock of transplant. 2. Shift the money plant to indirect sun light or where it can receive light only in the morning. Too much sun light can burn the leaves. Hi i have potted money plant in water bottle almost every day 1 leaf develops a black spot it grows n finally the leaf turns entirely black. Is is plant infected or is there something else? My money plant in water and in soil does not grow at all. Have tried to grow it many times but in vain. You are probably not taking the correct cutting of the money plant. Take a 7-8 inch long cutting below a node, that is where leaves are formed. At the node you will see a little root type formation. Dip this portion in the water after removing the leaves at this point. Take a cutting below a node where leaves are formed. At the node you will see a little root type formation. Dip this portion in the water or soil after removing the leaves. Don't put any leaves in water or soil. I plant it direct in the soit in indirect soil and water it almost every 3 to 4 days so that it start the roots but every time it burns and turn black and don't grow. Try to start with a small stem, about 8-10 inch, ensuring that at least one node is in the soil. Place the plant in shade. Thanks mehta for all the helpful information. I have a money plant which is growing pretty well however it's leaves turn old very quickly .it gets holes in leaves and seems like have been burnt.also I can seen some mostiques like insects in its soil. It is planted in big sized pot and kept in shade. Can you advise how can I help turn it's leaves look fresh. How to grow leaf bigger size. My money plant has two stems extending on opposite sides. In between the pot I have inserted a stick for creeping purposes. How can I connect these two stems to the stick so that instead of growing sideways it creeps upwards. My money plant in water grew initially fast and has vast roots. However from few weeks it has kind of stopped growing and is remaining with 5 leaves. Its neither dying nor growing any further. Any tips? Wait for some time to grow the branches to grow, then tie them up on the stick. Can we put used tea leaves n egg shells as a home manure for money plant grown in soil n how often can we use it? what kind of water? a mineral or what? You can use normal tap water. You can use ised tea leaves and egg shells as manure, once each month. I moved my money plant from a drafty window to a room with indirect sunlight and now the leaves are turning yellow. What should I do? one day i transfer money plants to bottle to another vial . buy i cut some of roots, then after that all of the died , why? can we place it in bedroom? Yes, you can place your money plant in bed room. Try to place it in a position where it can receive bright direct or indirect ligth during day. Hi, my money plant is big and has long branches. I wrapped the plant around the sticks however they won't stay like that. How can I give them a good shape? Wrapping the money plant vine along a stick will not stay. You may tie them with the stick lightly. You can alsu wrap a branch onto the another branch. My money plant is growing just vertical.. single branch.. how to make it dense and have more branches? and also need help about how to transplant it from a small pot to a bigger one? Cut the growing end of the plant. It will promote more branches. if your plant has grown to a very long height, just cut 8-10 inch long branch below a node and insert it in the soil (node in the soil). It will grow into a new plant. Transplanting is not a problem. Just tap the pot from outside, or if the pot is a plastic one, press it from several places all around to loosen the soil. Hold the plant between your fingers and palm and upside down the pot to take out the plant. Try not to pull out the pot forcefully, it will damage the roots. Can we place it in bathroom. i don't have enough space at my balcony. Yes, you can place it in bathroom. In fact, the plant is growing well in my daughter's bathroom. Hi my money plant pot has earth worm plz tell me what should i do? Do nothing. Earth worms in soil is a healthy thing, they make the soil fertile. I have placed the money in big glass jar now it is growing I keep changing the water very fifteen days and wash the jar down many roots r coming but the roots have became sticky can I cut it if I cut again roots will grow please let me know. Changing water is fine, but do not touch and cut the roots. Just change the water 2-3 times with roots in the jar, that will somewhat clean the roots. Hi , I have a money plant growing well..but have observed that there are some nodes that are just hanging around ...having no leaves .not sure if those are Stems growing in new branch altogether . I am confused if I should cut them all...it has grown on almost each node and it growing day by day. Without seeing picture, I can't say. But most probably these are not new branches, but small roots. If you cut the vine at this point and put in water or soil, then it will make a new plant. I have a money plant in water and one in soil, is it OK to put the twigs of yellowed leaves of soil one in water of the other, I heard it acts as fertilizer for it. Yes, you can add the old fallen leaves in the soil, but discard the diseased ones. I transplanted a money plant to a bottle filled with water 2 days before it's leaves have developed some small brown spots, however plants seems to be alive. what should I do? I hope, the part of the stem inside water has at least one node. Wait for a few days, hopefully, the plant will develop new leaves. I have put a cutting in water and it is just beginning to grow a root which is now about 1.5mm long. How long does it need to be before I can transfer it into soil? Let the plant develop more roots. You can transfer it into soil when you see many long roots, may be in 1-2 month. My money plant is a huge soiled pot and is growing fine, but I notice its notice the top part of the soil is super dry and getting less. 1. Should I water spray to keep top part atleast moist? 2. Should I add more soil - I want it to continue growing. 3. The plant is touching the wall, is that okay or does that effect it from not growing? Loosen the top soil, add some cow manure or compost and water well. Touching to the wall is OK. I grow money plant in a glass bottle..it grows straight with out any branches and it's leaves have become very small after I had transfered it to the bottle..can I trim those straight stems to develop branches? I have tried planting the money plant 4 times and always they turn Yellow and whole plant dies while I place it in a jar of water. Now I have cut 2 small plant at 45 degrees and put it in a small pot with soil. The routs had not grown while I put the plant in the soil.. I water the plant every 3 days when the below tray becomes dry but the soil remains moist. 2)I should have waited for the rout to grow in water then planted in soil ? Should the soil dry completely until I water it next time ? 3)Mr.Mehta is there any way I can send the picture of the plant ? You can pinch the growing end of the branches to make the plant dense. 1. Always put the end of the cutting with a node, means the portion where the leaf is attached. Remove the leaf and put the stem in water or soil. 2. Do not put any tray below the pot, this way the plant is resting always in water. This can make the plant over-watered and the leaves become yellow and ultimately kill the plant. 3. Transfer the plant from water to soil only when the roots are developed. Please read the details on how to propagate money plant from cutting . My contact is given on About page. I planted Money plant seeing this post in a 2.5 litre bottle base. It is growing healthy. But i want to try more plants. Can any seeds in my kitchen work for me? My money plants are more than two yrs old in their pots. their roots are coming out of drainage holes, how do I trim the roots? Also while their tips are bushy, old stem portions are bare & look ugly, how should I prune the stems so that they always remain bushy and dense? Should I allow their aerial roots to sink into pot soil? 1. Transfer the plant in a pot of next size, i.e. if the present pot is 10 inch size, then transfer the plant into a pot of size 12 inch. If you want to use the same pot, then carefully take out the plant and trim the thin roots, remove some old soil (if possible) and replant the plant using fresh potting mix. The aerial roots can be put in the pot soil. The bare stems can be cut and replanted in the same pot or other pot or put in a water bottle. They will develop roots and new leaves. New branches will also grow making the plant denser. I had shifted my money plant in the terrace where it receives directsunlight for three hours only in the morning but it has started getting yellow and leaves are falling.even the roots in the stems are drying what should I do? If you want to place your money plant in sun light, then put a thick layer of mulch like sugar cane mulch on the top of the soil. Also give more water, probably morning and in evening. You may also add a few water crystals in the soil, the best is to shift the plant to shade. Put your money plant in the corner which receives direct sun light for the least time. hi i have transferred my money plant one bottle to plastic pot but after some days it has changed yellow leaves n branched n roots also spoiled,so wt can I do pls suggest me. 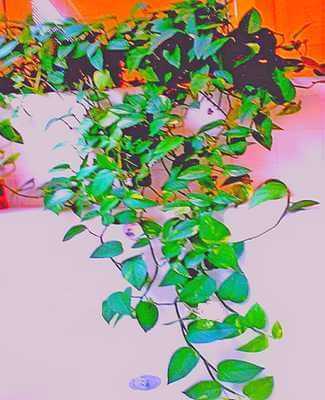 Ali Raza March 18, 2017 7:53 PM.I HAVE A MONEY PLANT IN VINE bottleIN MY ROOM .CAN I CHANGED IT IN BIG bottle. Putting coco peat below the soil will retain the moisture, but may clog the draining holes. It is better to mix coco peat in the whole soil rather than to put it below the soil. I had bought a money plant from a nursery and kept it in the house watered it every 3-4 days but it became brown and dull. Thought it needed sunlight so I kept it out but it still died. The other plant I had kept in a bottle. It grew for sometime but then became dull and totally lifeless. Do the plants need sunlight? Or can they survive indoor? Why did both the plants die? Intense direct sunlight is not good for money plant. The money plant can grow well indoors as well. If growing in bottle, change the water (preferably distilled or spring water) every week. Do not feed any strong fertilizer. My aunty says ice cubes or cold water is good for money plants. Also, I heard that don't water money plants too much. I really want my money plant to cover my entire window grill. What to do to make it happen? A liquid feed every 3-4 weeks will help. Hi, I changed the pot of my money plant and by mistake I cut the excess roots. I changed the soil too. Now my plant's leaves look really loose and aren't shiny at all. My plant is approximately 8 feet. Please let me know what I can do ASAP. Keep the soil damp, spray water on leaves and keep the leaves in shade. If the leaves fo not regain their firmness, then you will have to cut off the longer branches to half or more. I think the plant will revive on a few days. Next time, please put your name, otherwise the comment will not be published. Hi, my name is sunil. my money plant stem was in water for 1 momth and roots were grown about 2 inches. I converted it into soil and observing for 1 week that its growth has stopped. No new pointed leaves are coming out. Please suggest what should I do? Also my plant is placed inside the room near window where it receives bright light. Do nothing. Plant takes some time to settle in soil. It will start to grow after some time. Hi! Your post is very helpful. But by mistakenly I over watered my indoor money plant. Now leaves are turning yellow. How to save my plant now? Yellowing of money plant leaves may be just normal. Once a year someleaves become yellow. You may not water your money plant until the top 1 inch soil is dry. Hi, thank you for your reply. What happen if one of two roots is broken? Plant will die or it will regrow its root from that broken part? The money plant should not die. New roots will grow. Hi,i bought my money plant 4 feet high in a pot,its leaves are turning half brown and half green .i water them every 3rd day.but i think its drying ,i dont know why,im very concrned that it should grow properly.plz help. If it is too hot, move the plant in shade and water every second day. Follow the money plants tips given in the article. I want to share I am growing money plant in water added a few pebbles and my plant is growing fast and beautiful before I tried in water but not much growth but if you just add some stones it grows very well want some advice the money plant have small holes what do I use for it. Spray a week solution of neem oil on both sides of the leaves of the money plant to prevent holes. So far as the leaves of the money plant are green, the plant will grow after transferring it to soil from water. Some may take more time. Hi, I converted plant from water to soil. 1st leaf has come but old leaves are turning yellow and falling in the soil. Is it normal? If you have transferred your money plant from water to soil, then it would take some time for the plant to adjust itself in the new environment. The leaves may turn yellow and fall, but new leaves will grow. Some unseen and unknown insect is eating my money plant leaves. I tried spraying some commercial pesticides but it has not helped. Any suggestions? Apply neem oil spray on both the sides of the leaves and on stems. To make neem oil spray, ix 1 ml neem oil in half a liter water and add a few drops of dish washing liquid to it. someone told me this i cannot buy the mony plant for myself, it should be given to me as a gift for it to work is this true? In India, it is believed that one should actually steal a branch of money plant and put it in water at home to get its full benefits. My money plant has stopped growing and its old leaves aur turning yellow and then black. Yelloying of money plant leaves is normal once year. They will drop but new leaves should come again. I am growing the money plant tree in a water bottle (mazza bottle) with water replaced every 5 days. It is quite healthy but I want it to grow a bit faster...can you give me some tips so that it grows faster vertically? You can spray some liquid fertilizer on the leaves periodically to encourage growth of the money plant. Where can I find this tree in Botswana, Africa? Its 2 months, no new leaf has come. Also the last leaf is turning black. Please help, I want to save the plant. Sumil, if the stem is green, the plant will not die. The plant may be dormant. Sunil, if your money plant is long enough having 5, 6 nodes, then cut the branch below a node with a small root like thing and put the branch in the soil. It will start to grow into a new plant. My money plant just have a single twig and it keeps growing good.How can I get more branches and make it bushier? I like to propagate but since it has only one twig,I didn't cut its tip as it may affect its growth. Sorna Lakshmi, you just cut the growing end of the stem. This should encourage branching. How often should I water my money plant? Its indoors and I live in tropical whether 25-32 degrees. My money plant is not growing for last 7 monthe. Can I change the soil , if yes how to do it properly? Megha Saha, You can water your money plant once a week, when the soil dries out. Amit, you can change the soil of your money plant. Simply take out the plant from the pot and remove the outer soil carefully. Re-pot in a new pot with new soil. If I put the stem of money plant with 5-6 nodes in soil but no leaves, only stem. Will that work out ? Your money plant should grow new leaves, putting one node would also root the plant. Try take a moneyplant stem, about 8-10 inch long and put its one node in water. New roots will grow in a few weeks. Then you can put the plant in soil. I've had a money tree since it was small. Now it has grown approx. 5 feet. Right now it looks like a pole with no leaves. They all turned and fell off. I want to cut it back to 3 feet and see if it'll grow again. Your advice is appreciated. Thanks. You may cut 2 one foot long pieces from the end and put them in a bottle containing water. Cut the pieces at a node. New roots should develop in a few weeks. Good luck!